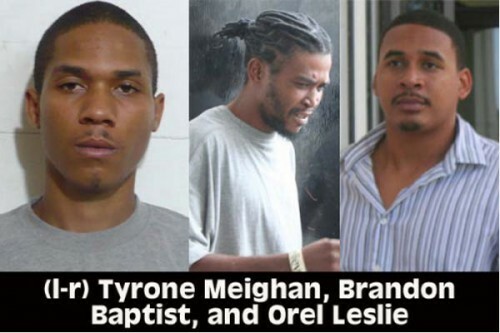 Tyrone Meighan, Orel Leslie, and Brandon Baptist arrived at court today with hopes of going home after the last adjournment of their murder case on August 21, 2013. The three men were accused of killing James Norales, 28, on November 23 last year. Norales was gunned down at the intersection of Fabers Road and the George Price Highway. Police arrived on the scene to find Norales with multiple gunshots to his head, neck and body – left for dead in the middle of the road. The families of Meighan, Leslie, and Baptist were “beside themselves” on the scheduled date of the hearing, which was August 21, after learning that no removal orders were sent for the trio to appear, which is something they believed to be a deliberate act on the prison’s or court’s part. According to what was relayed in court, there was a mix-up in the dates, in which the figure “1” was mistaken for the figure “7”. On that date, August 21, lawyers for the trio, Arthur Saldivar and Ellis Arnold, requested that the prosecution come prepared for the Preliminary Inquiry (PI) to be held at the next adjournment after the prosecutor told the court that he was not prepared to do so, since he had recently received the case file. At that session, Magistrate Dale Cayetano adjourned the matter to today’s date, in the hopes of giving the prosecutor enough time to prepare, and have the matter heard before the Senior Magistrate. But this morning, even though the trio was brought down from prison, the matter was again adjourned after the prosecutor asked the court for a further adjournment because the case file was still at the office of the DPP. This was much to the chagrin of the lawyers representing the men, and Saldivar objected to the adjournment stating that “It was known that submissions would have been made today…There is no basis to come to court to say they are not prepared when they were the ones who had asked for the adjournment so they could prepare…This is a great injustice… What we have as it relates to disclosure, what has been provided to us, has no grounds to support these men’s incarceration”. Arnold also objected to the adjournment, stating that “It is not proper after all that has transpired for the prosecutor to just get up and ask for an adjournment without giving any kind of compelling reason for the adjournment; I am urging that the matter be struck out”. Court was adjourned for one hour, giving the prosecutor time to consult with the DPP on what his next move should be in this case. When court resumed, the prosecutor reiterated his plea for an adjournment, telling the court that the DPP is still working on the file. The adjournment was granted and they are scheduled to appear back in court on September 13, 2013.